PyrateJohn - the meanderings of a rogue Pirate looking past 40: Man, time flies when you are having fun! Man, time flies when you are having fun! When I started this blog I promised myself that I would try to post something every week. Last weekend I started to write that at least two weeks had past since my last post. Now ... shoot ... at least three weeks have gone by. Isn't life just like that? One week it seems like you are in high school. And the next week you are looking at walking canes and thinking ... y'know ... those don't look bad at all. OK, so that's a slight exaggeration but you know why I mean. "And if you wanna hear God laugh, tell Him your plans." Surely their older brother Ronnie and his friends Cassie and Steve Gaines never expected their careers to come to a halt that fateful day when Lynyrd Skynyrd's plane came crashing to the ground in the woods of Mississippi. So one needs to roll with the punches. Because as long as we are above ground, today is destined to be a good day, even if today doesn't quite live up to the expectations of previous or future days. I haven't written for several weeks for a variety of reasons. For one, Deb and I both came down with The Crud. The Crud is some sort of bronchitis has been going around and it lingered with us for about 3 weeks. It hit my office pretty hard and is starting to make the second round. I jokingly call it Lovingood disease after a pal of mine who had it at our company Christmas party and, sure enough, I had it a few days later. Coughing, phlem, loss of voice, lack of energy, and a generally crappy attitude are all part of the symptoms. When you have The Crud you don't feel like writing. And everything that you write comes out sounding like "poor me ... I ain't got no energy" and no one wants to hear that. Secondly, I got a promotion at The Day Job. Now, I realize that for many of you who know me either through my writings or in The Real World it's hard to imagine that I would get promoted, much less hold down A Real Job (tm). But it's true. Moving upward and onward to better things. Or at least I am busier right at the moment and haven't had the opportunities to write lately, let's put things that-a-way. But fear not. I'm optimistic that I'm going to allocate time to write a bit. It's all a matter of will power, right? The promotion came at a funny time because Deb and I had been openly telling our friends that we were going to fire up the RV and move on down the road, most likely right after January 1st. Deb is a realtor and the Florida real estate market, for those of you who haven't heard, has ground to a complete halt by all accounts. And we had a strong sense that after 6 years with my employer that it was time to move on to more exciting pastures anyway. So we had told most of our friends that we were moving to Tampa. But I wanted to take some classes and they weren't offered in Tampa, and that put a crimp on things. Then we decided that, realistically, we had at least 1, if not 2, years worth of work and upgrades to do on our motorhome, motorcycles, and other vehicles before we could do what we REALLY want to do, which is to move further westward and explore a bit. So consequently when my employer started ramping up to develop a separate mechanical contracting company, and I was offered a promotion here in Jacksonville, it was like ... well ... deja vu all over again, as Yogi Berra was so classically quoted as saying once. That, and lately Ms. Deborah's real estate business has come roaring back pretty dramatically. She has found a niche in negotiating mortgages down with the mortgage companies and getting otherwise unsellable properties sold in this really lousy market. The past year was tough on us financially (the biggest casualty was that we couldn't take a planned motorhome trip into Mexico this December) but lately things have been pretty good, as evidenced by the gently used 7-series BMW sedan that she's been driving lately. It's been sitting here for the last week and now has permanent license plates on it, so I guess that she intends to keep it. Along those lines, we moved the motorhome to our workshop. We have been leasing a nice garage-type building in an industrial part of town for the last year or so. Our landlord was kind enough to have cement poured and to make some improvements for us, including a dedicated 50 amp power circuit for the RV. When his primary tenant, a mortgage broker, moved out (and those naysayers think that the real estate market can't be THAT bad down here) we offered to move in temporarily, at least until he gets a new tenant that needs the space. We have really been enjoying this living because it puts us on top of what must be the only little hill in Jacksonville, in a fenced-in compound, and right next to our tools, vehicles, supplies, and so forth that are in storage. From the street you really can't see that we are there although the RV looms above the fence. There are actually some nice restaurants and shopping nearby along with one of my favorite neighborhood biker bars (you know that you have reached a certain point in life when your local biker bar lets you drink for free and feeds you because you spend so much time with their website, computers, and so forth). The other "interesting" thing about this part of town is that, well ... how can I say this nicely. "Industrial" is a euphamism for "rough." Oh, there are certainly some little enclaves of fancy living near here (after all, we are near water and you know how waterfront property is) but many of our neighbors aren't exactly part of the country club set. We have met some friendly folks over here but every so often we get entertained by the cops rousting the crackheads and the street walkers. This is also an area with a large immigrant population and while it's great learning Spanish at the local Mexican and Honduran restaurants seeing this side of Jacksonville must be eye opening for many of those folks. One downside to living at the workshop is that we are discovering that our holding tanks are completely full within 6 days, and then we have to run to a nearby RV park and dump them. This is turning out to be something for us to take a hard look at as we contemplate future disaster relief work. On the other hand at least one of our cats has finally gotten to be brave enough that she doesn't run and hide when we start driving the RV. Coyote has decided that the view is better when she is sitting on the dashboard rather than hiding underneath the couch, like her compatriot usually does. It's an Earthroamer. 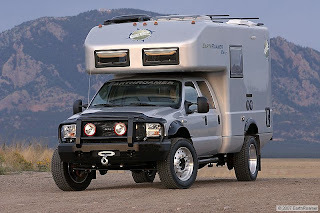 All wheel drive and build on a Ford F550 chassis, this is an RV for some serious off road adventuring. But better bring your large wallet. Or evidence of your trust fund. 'cause prices start at $200,000 and while that's not too bad as RV's go it's a bit steep considering the somewhat limited space inside one of those things. Still, they show all the signs of being very well thought out and well constructed. And being the perfect truck for those Alaskan or Baja fishing adventures. As long as the Significant Other doesn't take up as much space as most guy's fishin' gear. if you want more info on the Earthroamer. Several folks have asked me about the down and out neighbors that lived near our workshop, and who had no heat just as the weather here got cold. I am saddened to report that they seem to have moved out. I made several trips over there looking for them when we were living in an RV park and now that we have been at the workshop for almost 2 weeks their house is vacant and we haven't seen them. Things are certainly tough when you are poor. Another house near here caught fire last week and as I was riding to work several members of the family that were living there were standing on the curb, in the cold, as the fire department rolled up their hoses and prepared to pull away. Now that house is boarded up. The local news reported that the family was in the process of buying that house and were two days away from closing on the sale when the fire occurred.